Dentures have been used for hundreds of years to give people with missing teeth a full smile once more. They’ve came a long way since Egyptian times, making today’s dentures more realistic and reliable than ever before. 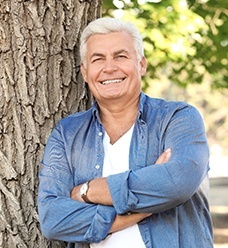 At Jacksonville Dental Specialists, Dr. Matthew Nawrocki and Dr. Richard Aguila are trained and experienced in providing patients with comfortable and natural-looking dentures. Keep reading to learn everything that you need to know about dentures and how you can benefit from them. 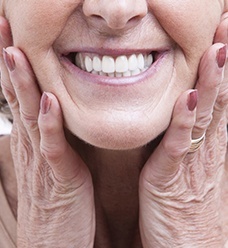 Dentures are one of the most common and popular options for replacing teeth. A denture is composed of a plastic, gum-colored base, which is attached to false teeth. 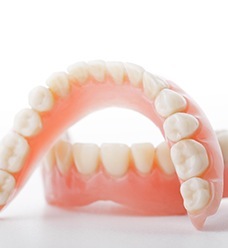 Dentures are made with a plastic resin to be as comfortable and flexible as possible. Depending on what you want out of your replacement as well as how many teeth you’re missing, we will recommend partial dentures, full dentures, or implant-retained dentures. They are held in place by natural suction, dental adhesive, or clasps based on the type of denture that you have. The best way to find out which one is right for you is to visit our office. 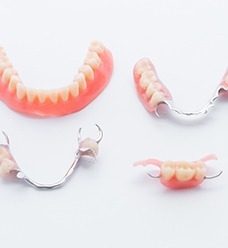 We will typically recommend partial dentures for patients who have multiple teeth missing consecutively but still have some healthy natural tooth structure. This allows for a complete-looking smile while keeping your natural teeth at the same time. Partial dentures will usually be held in place by clasps that fit over your teeth. If you’re missing the majority or all of your teeth in a single arch, full dentures can give you a new and beautiful smile almost instantly. They stay in place using suction or adhesive, but you should take them out each night for cleaning. Dr. Nawrocki or Dr. Aguila will take impressions of your gums to provide you with the best-fitting denture possible. If you want the benefits of dentures with the most secure function and feel, implant-retained dentures could be the best option for you. Using dental implants that are placed in your jawbone, we can secure your dentures to give you the most natural-feeling restoration. Plus, dental implants help to preserve the strength and function of your jawbone. Dentures provide you with a full smile, which can in turn boost your confidence. If you avoid speaking or laughing because of your missing teeth, dentures can restore your smile for a younger-looking appearance. They will also allow you to eat more of your favorite foods, giving you a more nutritious and healthy diet. Lastly, implant-retained dentures can keep your jawbone from deteriorating over time and allow for a secure and stable denture. The cost of your dentures is hard to determine without examining your mouth. There are many factors that play a role in the price of your prosthesis, which is why you should contact our office to schedule an appointment. We accept insurance and do our very best to make dentures as affordable as possible for you and your smile.